UPDATE May 8 4:30 p.m.: Following publication of this article, a spokesperson at PricewaterhouseCoopers told the Washington Free Beacon that it addressed the lack of disclosure of foreign grants in previous Clinton Foundation tax filings. PwC, which took over accounting duties for the Clinton Foundation for its fiscal year 2013 filing, noticed that previous filings by the Clinton Foundation did not "break out" the list of foreign grants it received. Accountant Laura Parello "recognized that and came to the conclusion that they had to be disclosed for the 2013 return," according to the spokesperson. PwC also said it is not conducting the current review of Clinton Foundation tax returns, which the foundation says will "likely" result in multiple years of tax forms having to be re-filed. Bill Clinton put the blame for his foundation’s foreign donor scandal on the accountant who filed its taxes in his Monday interview with NBC News. "There was no attempt to hide [donations]," Clinton said from Kenya. "The guy that filled out the forms made an error. The guy put it on the wrong form … I can’t explain why they didn’t do it—all I can do is fix it." In the wake of the scandal surrounding the foundation’s foreign donors, chief executive officer Maura Pally said mistakes were made in tax filings and that multiple years of tax forms will "likely" have to be re-filed after an external review is completed. It is unclear which accountant is responsible for the errors. Laura Parello, the managing director of PricewaterhouseCoopers’ (PwC) exempt organization tax services division, signed off as the "paid preparer" of the foundation’s most recent tax filing. When asked how the accountant responsible for preparing the Clinton Foundation’s tax filing felt about being blamed by the former president for the current scandal, PwC said it was unable to comment due to company policy. PwC also would not comment on whether it was conducting the current external review of the Clinton Foundation’s financial reports. In addition to preparing the document, PwC also conducted an independent audit of the 2013 report and wrote that its opinion was that the information was presented "fairly." The auditor’s note, however, says it is the foundation’s management that is responsible for presenting financial statements that are "free from material misstatement, whether due to fraud or error." The 2013 filing says Hillary Clinton spent 20 hours per week working for the foundation, in addition to five hours per week of work for related organizations. The Clinton Foundation did not respond to a request for confirmation on whether she worked the number of hours stated in the audited document. Nor did they respond to a request for clarification on who Clinton was referring to as "the guy" who "made an error." Also signing off on each year of Clinton Foundation tax returns is Andrew Kessel, the foundation’s chief financial officer, a position he has held since 2004. PWC was hired to handle the foundation’s taxes in 2013. Prior to that, BKD LLC in Little Rock, Arkansas, handled the foundation’s taxes since at least 2009. BKD did not respond to a request for comment on the comments made by Clinton to NBC. 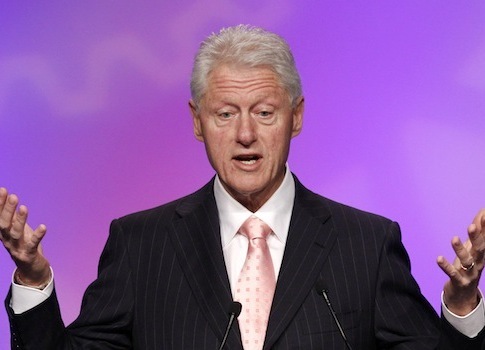 The Clinton Foundation failed to disclose 1,100 foreign donations it received. This entry was posted in Politics and tagged Bill Clinton, Clinton Foundation, Hillary Clinton, Taxes. Bookmark the permalink.